In today’s generation, we hardly get time to have knowledge about what’s happening around us and on our planet and that is why people watch news. Well, in this fast lane life, who gets time to stick to a television set and watch a couple of news? So, let us talk about Best News Apps for iPhone 6S/6S Plus, iPhone SE and iPad that are perfect for worldwide news! Well, you might not be surprised when you saw FlipBoard’s name on the top and the precise reason behind it its simplicity. The application’s user interface is the most amazing thing about it as it is very easy to use and read. FlipBoard is used by millions of users and its overall rating is 4.5 + and all of this is enough to prove how good it is. You can also connect your Facebook, Twitter and Google+ accounts which will enable you to receive the news from your timeline directly onto the Flipboard app. To Get the Apple News App on iOS 9 outside United States Follow below Steps. Go to Setting on iPhone/iPad/iPod. Select General tab, Click on Language & Region. Change Region to the United States. Reboot iOS device and Enjoy Apple News App out of the United States. Pulse is the only application that is in competition with FlipBoard app. Pulse features a reader-friendly design in which you are served many news in a single view and you can even scroll to get more of them. Just like FlipBoard, you can also connect your social networking accounts to Pulse and then enjoying reading your news from your social media accounts too. When we talk about news applications, how can Google be far away from this? The answer is Google Currents! Google Currents follows a twin window kind of design in which your screen gets divided into two parts, one is the category and another is the article. If you get the application in your iPad, you will get a 3 window Google Currents app which will have a category, articles and preview pane as well. Google currents have the ability to show articles from famous news broadcasters. If you loved the Google Reader application from the olden days which is now a dead application, then this is definitely the one for you because the Google reader is back, not exactly back, as Feedly claims to be the successor of the world famous application. 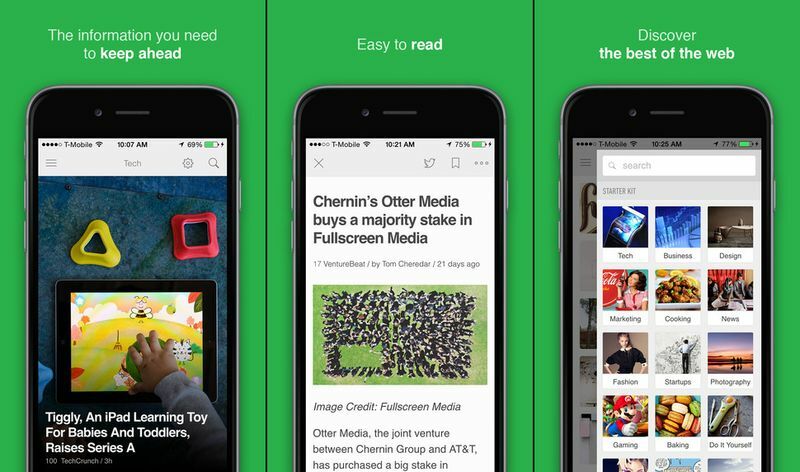 The Feedly application is based on RSS feeds and the application is all about blogs and stuff. If you are mad about certain things like technology hacks or music then this app can be your top pick. Android smartphones are becoming bigger and bigger but the same pattern is not followed with the Apple iPhones. The average sized iPhone is a 4.7 inch display which still is okay for reading but the previous versions were only 4 inch and so. This made reading quite difficult and this is when you remember Digg! Digg features a unique minimalistic design which helps you in reading news clearly even on the small screens. It is not always necessary that you have time to read the full article every time you open something. Then you would have to leave it in between or take screenshots and stuff but not anymore as Pocket will allow you to bookmark your articles so that you don’t lose a track of your readings. You can add the articles in the read later section and check them out anytime you want. The Pocket application will even allow you to select your forte of reading and will also suggest you the best applications according to that. Zinio is one of the most used applications for worldwide news. If you are a huge fan of traditional newspapers and magazines then Zinio will definitely satisfy you. Zinio has huge collections of newspapers and magazine including the world famous, The Economist, The New Yorker and much more. It isn’t hurts our pockets that much as you can pay per subscription or you can also get a full year Zinio Subscription. If you think Instacast 4 is the best application, then you might have to think again because its rival, Pocket Casts pack more fun than that. Pocket Casts can do the exact same thing as the Instacast 4. Then how is it better? Well, you can get Pocket Casts extensions in your browser if you want to stream your data on the computer or laptop. You can even skip the boring parts automatically and you can also decrease or increase the playing speed. Timeline is an application which will allow you to read not only news about what is happening right now but also the past. You can easily read the past news which are differentiated according to dates. So the next time you are going for an interview, you must try Timeline as this is free to use. Do we really have to tell you about The Washington Post app? Well, your famous newspaper now got an application which has one of the most user-friendly UI we have ever experienced. You will get daily feeds in your notification panel along with cool previews to the news. When you open the application, you will be able to see the related pictures as well as videos which are based on the headline. NYT Now stands for The New York Times which is an award winning newspaper company that is known for its articles and news coverage. Well, this time, they have covered the iOS and what a treat it is to see news through their application. There is a morning section which tells you about the day and the date and the history of the date which is pretty cool. Some people doesn’t really like the news being shorten because obviously, you have to edit out some important information to make it short. So if you have a lot of time and are willing to read longer articles, then you must get your hands on Longform as the news app for iPhone gives you articles which are longer which means full information. There are thousands of publishers so there is no shortage of articles for sure. So there is something for everyone on the application!